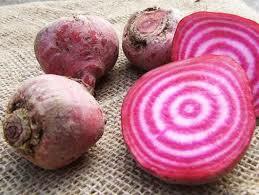 Beetroot ‘Candy Stripe’ is a beautiful deep-pink skinned, stripy pink and white fleshed beetroot with a sweet flavour. It looks spectacular in salads. Try grating it raw – so you really see the stripe. Cooked it turns a brilliant pink, fabulous in contrast to the purple and orange on the plate. The dark green leaves are mild in flavour too – and great for adding to salads or as a steamed side vegetable dish.